Curcumin is a natural polyphenolic compound isolated from turmeric (Curcuma longa) with well-demonstrated neuroprotective and anticancer activities. Although curcumin is safe even at high doses in humans, it exhibits poor bioavailability, mainly due to poor absorption, fast metabolism, and rapid systemic elimination. To overcome these issues, several approaches, such as nanoparticle-mediated targeted delivery, have been undertaken with different degrees of success. 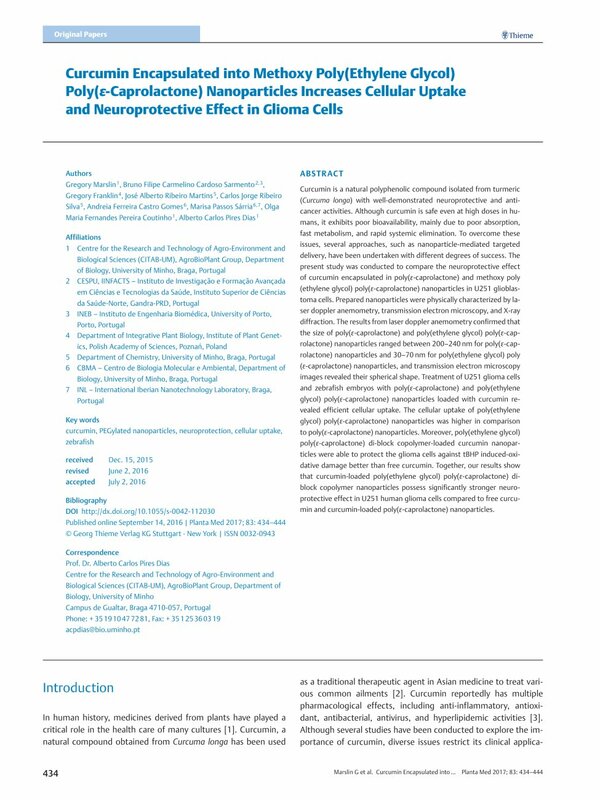 The present study was conducted to compare the neuroprotective effect of curcumin encapsulated in poly(ε-caprolactone) and methoxy poly(ethylene glycol) poly(ε-caprolactone) nanoparticles in U251 glioblastoma cells. Prepared nanoparticles were physically characterized by laser doppler anemometry, transmission electron microscopy, and X-ray diffraction. The results from laser doppler anemometry confirmed that the size of poly(ε-caprolactone) and poly(ethylene glycol) poly(ε-caprolactone) nanoparticles ranged between 200–240 nm for poly(ε-caprolactone) nanoparticles and 30–70 nm for poly(ethylene glycol) poly(ε-caprolactone) nanoparticles, and transmission electron microscopy images revealed their spherical shape. Treatment of U251 glioma cells and zebrafish embryos with poly(ε-caprolactone) and poly(ethylene glycol) poly(ε-caprolactone) nanoparticles loaded with curcumin revealed efficient cellular uptake. The cellular uptake of poly(ethylene glycol) poly(ε-caprolactone) nanoparticles was higher in comparison to poly(ε-caprolactone) nanoparticles. Moreover, poly(ethylene glycol) poly(ε-caprolactone) di-block copolymer-loaded curcumin nanoparticles were able to protect the glioma cells against tBHP induced-oxidative damage better than free curcumin. Together, our results show that curcumin-loaded poly(ethylene glycol) poly(ε-caprolactone) di-block copolymer nanoparticles possess significantly stronger neuroprotective effect in U251 human glioma cells compared to free curcumin and curcumin-loaded poly(ε-caprolactone) nanoparticles.